These darling cupcakes look like mini watermelons and taste so good! The perfect summertime treat. 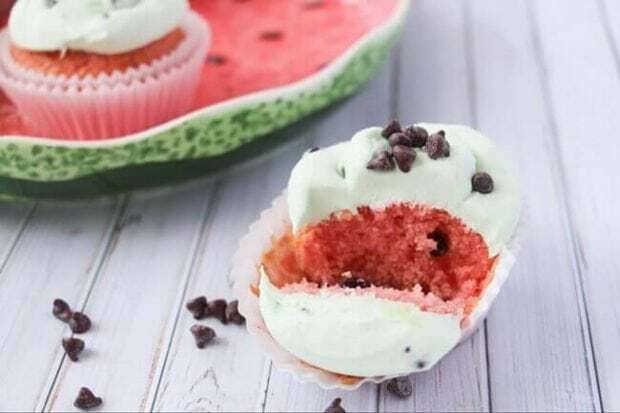 These cute and easy homemade watermelon cupcakes are such a fun summer food idea! Watermelon is the quintessential fruit of summer, but it can be a royal mess at summer parties. 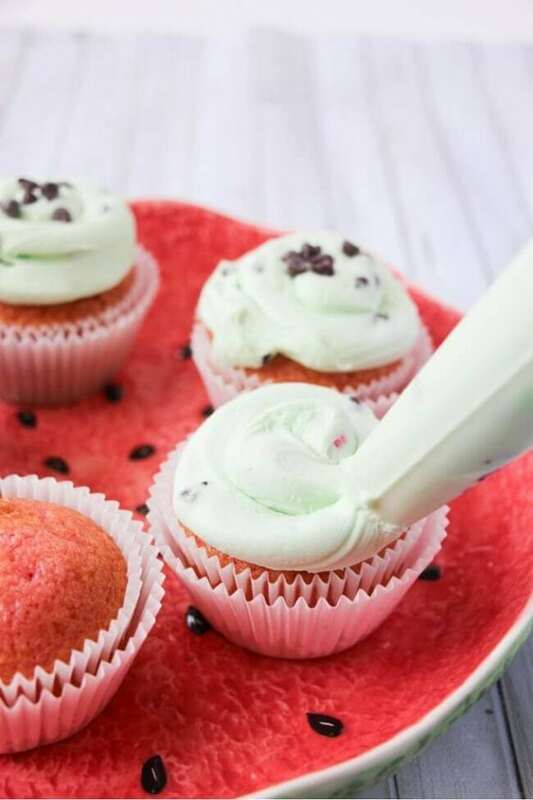 These watermelon cupcakes are an awesome, fun twist – sure to wow your guests without leaving them with sticky fingers or a mouth full of seeds! Don’t miss these 14 Cool Watermelon Crafts for a perfect summer time craft. Use these Watermelon Cone wrappers for your next ice cream social. Who wouldn’t prefer mini chocolate chips to watermelon seeds? 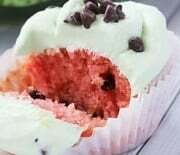 A fun and unexpected addition to these lightly flavored watermelon cupcakes, the chocolate chips add some whimsy but are completely optional. I think they’re darling! The green buttercream frosting seen here is vanilla-flavored but I’ve also experimented with watermelon cake and lime frosting and it was delicious! There is definitely some versatility to this fun food idea! I just used a simple frosting swirl technique with no special tips required. You can add two frosting colors or shades to your piping bag for a color swirl or special effect, but these cupcakes are all about “wow” without a ton of effort. We’re even doctoring a box of white cake mix here, this is about easy and fun party food. 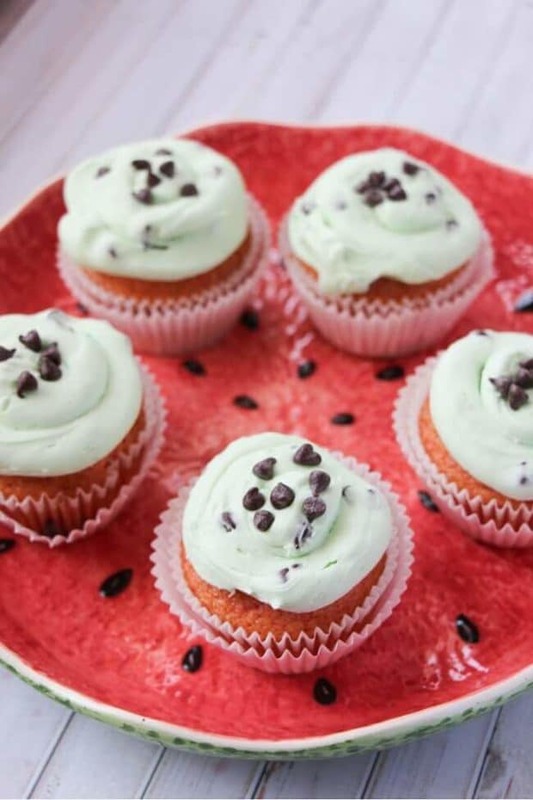 This watermelon cupcakes recipe is as easy as it can get! For these watermelon flavored cupcakes, we’ll need to gather a few things. Let’s head to the kitchen and get started. 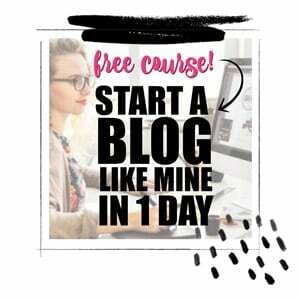 You’ll need White or yellow pre-made cake mix PLUS ingredients the cake mix calls for, mini chocolate chips, watermelon Kool aid packets, red and green food coloring, butter, powdered sugar, salt, vanilla or lime Kool aid packet, heavy cream or milk. I know some people like to make these with Jello as well, which is up to you! Preheat oven to 350F and line a cupcake pan with liners. Stir in the Watermelon Kool-aid packet and chocolate chips before adding additional red food coloring until you reach a pleasant pink color (you don’t want a deep red). Fill the cupcake liners about 2/3 of the way full and bake for 18-22 minutes until an inserted toothpick comes out clean. Mix the butter, 3 cups of the powdered sugar, salt, vanilla or Lime Kool-aid packet, and heavy cream or milk together. Adjust the consistency by adding more icing sugar with heavy cream and then add the green food coloring one drop at a time until you reach your desired color. Spoon the frosting into a piping bag, snip off the tip, and swirl onto your cupcakes – starting at the middle and swirling out, then swirling back in towards the center. Sprinkle with a few additional mini chocolate chips before serving. Look how cute! 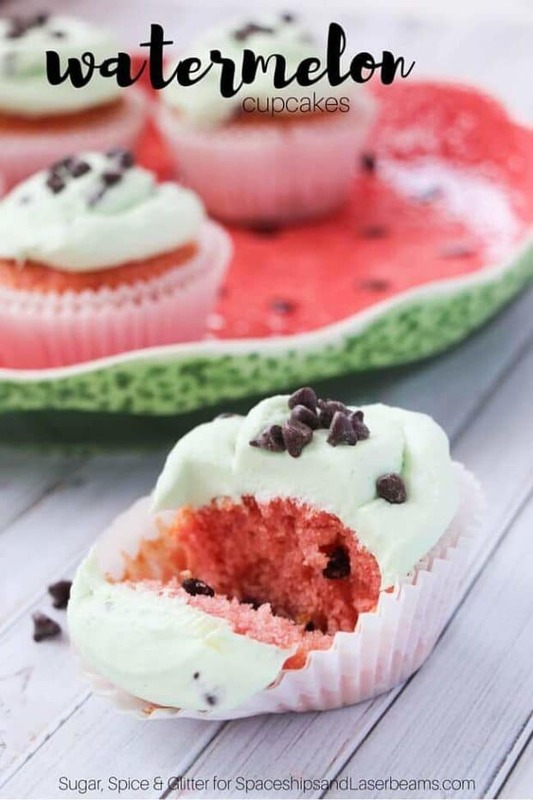 These Watermelon Cupcakes would be a total splash at your next summer party – make sure to pin them for later. Sprinkle with a few additional mini chocolate chips. 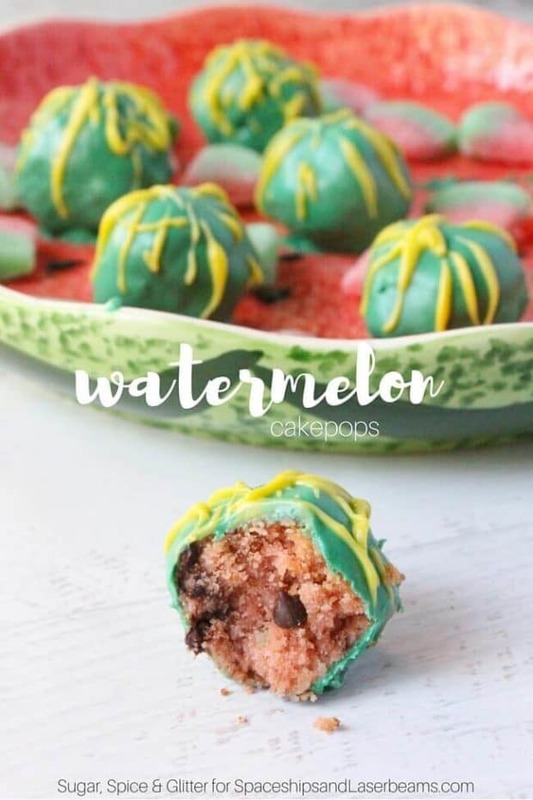 Check out more great watermelon recipes. My daughter loved it and told us that she want to share it with her friends.